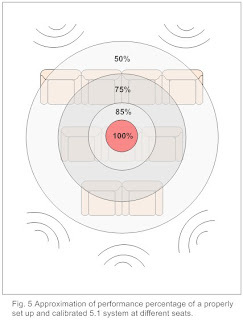 The idea of averaging multi-channel sound for all listener positions is not a good one. There are many audio myths out there. This one has many professionals fooled. It is a popular practice that should be better understood before it is applied, especially to small, critical listening spaces such as home cinemas, production suites, etc. 1) It won't average the time domain at more than one location. 2) It won't average energy levels at more than one location. 3) It won't average the reverberation times at more than one location. 4) Each seat will still have a unique sound even with frequency averaging. 5) Only one seat can be calibrated for audio nirvana at a time. This is because multi-channel sound can only converge at the same time, energy and frequency response, at a single point in space (See Fig. 5). 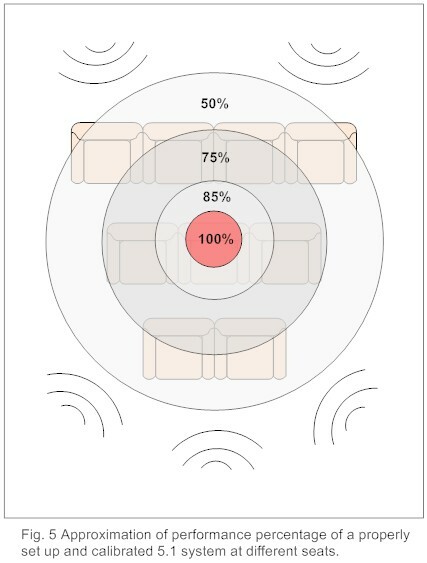 This location should be the primary seat, which should be located in the middle of the listening zone, so that more listeners are closer to the target. 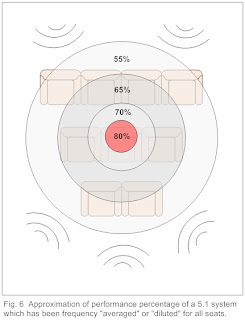 6) If we average the frequency response for all seats, all seats suffer (See fig. 6). 7) Equalizers can only change the the frequency response of the signal being fed to the speaker(s). They do not respond to room interaction. Once the signal leaves the speaker, the room takes control of the sound energies. 8) Equalizers are good for reducing peaks and poor at increasing dips. 9) The differences between seats is not small. They can easily differ by 30 dB SPL. As the number of seats increase, so does the variance, as do rooms with seats close to boundaries and/or rooms with particularly bad modes. 10) Selecting a "room curve" for spatial averaging, guarantees the original signal is lost. The point in the room where time, energy and frequency converges should be the center of the listening space. Any other seat will be compromised to a degree regardless. Why compromise every seat? As depicted in Fig. 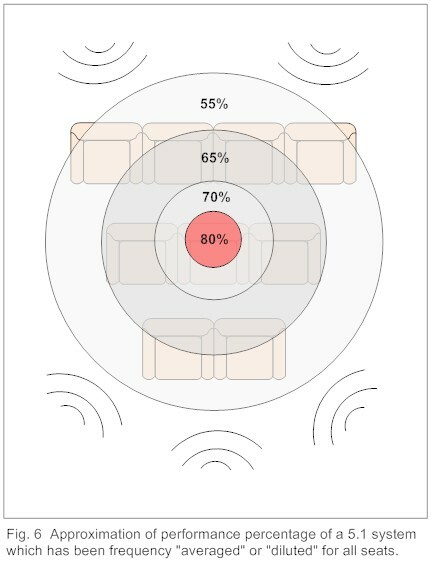 5 & 6, more seats will exhibit better sound without averaging frequency response. In addition, audio nirvana can be experienced in the primary seat. The idea that "global equalization" equates to "great sound at every seat", or even that the sweet spot becomes bigger is not accurate. Applying this scheme means degrading the sound for everyone and lessening the experience otherwise possible for the money seat. Sometimes poor room mode distribution may call for some electronic equalization. A 1/20th octave band parametric equalizer could be introduced to smooth these low frequencies (around 300 Hz. and below). Remember, we are changing the frequency response of the signal driving the speaker, and are trying to compensate for how the room is reacting to it from our personal point of view. Room mode anomalies can mean a difference of 30 dB between a peak and valley. An electronic equalizer can do a good job of reducing peaks, but can not offer more than about 6 dB of gain for a coincident dip. Note that most of the equalizers used for this process use steady-state measurements with a microphone collecting sounds from every direction in the room. It sums them together for analysis and then a programed solution is applied. This is not the way humans process sound with two ears and a brain. Even fancy digital signal processors (DSP) with time domain correction cannot compensate for room reflections, etc. because they cannot separate where the sound is coming from. As a side note, they also sacrifice frequency resolution in order to analyze time. In summary, electronic room equalization, ideally, is used when passive corrective means are not possible, or in conjunction with passive means. Ideally, this equalization should be of the high resolution, high Q, parametric type, and only be used to address room mode problems around 300 Hz. and below. This is assuming that the speakers used are accurate to begin with. If they are, global equalization across the audible spectrum will likely do more harm than good for all seats. I've listed ten reasons why spatial frequency averaging is not a good idea. There are many more. Can you think of some of them? Please comment in the box below. How Bad Can a 1% Air Gap Be to Noise Control? Noise control is a two way street. You may have spent considerable expense on the design and materials of a wall, ceiling or floor system to keep noise from escaping or entering the space. However, you may not realize the impact a tiny hole can have on the entire partition's performance. Most people know that the door is the weak spot in a wall system. You can have a high sound transmission class (STC) rated wall system cut to half the rating if you don't incorporate an acoustical door, or not have one properly installed. There are two primary means that sound energy can travel through walls, floors and ceilings; vibrations traveling through solid materials such as gypsum, sheathing, studs or joists are called structure-borne vibrations, and vibrations traveling through air, framing cavities and unsealed penetrations, seams or gaps are called air-borne vibrations. Both vibration paths play an important role in determining how well the partition assembly will reduce the transmission of sound through it, and a "systems" approach must be in its design to appropriately address the associated sound energies. A systems approach would incorporate a combination of blocking, breaking, absorbing and/or isolating the energy at the source, along its path(s) and/or at the receiver. We are covering just one of these aspects of noise control in this particular blog. Air filtration and sound penetration through walls, ceilings and floors occur as one in the same. If air can penetrate a partition, then so can sound. In fact, it takes very little air leakage to cause significant sound leakage. 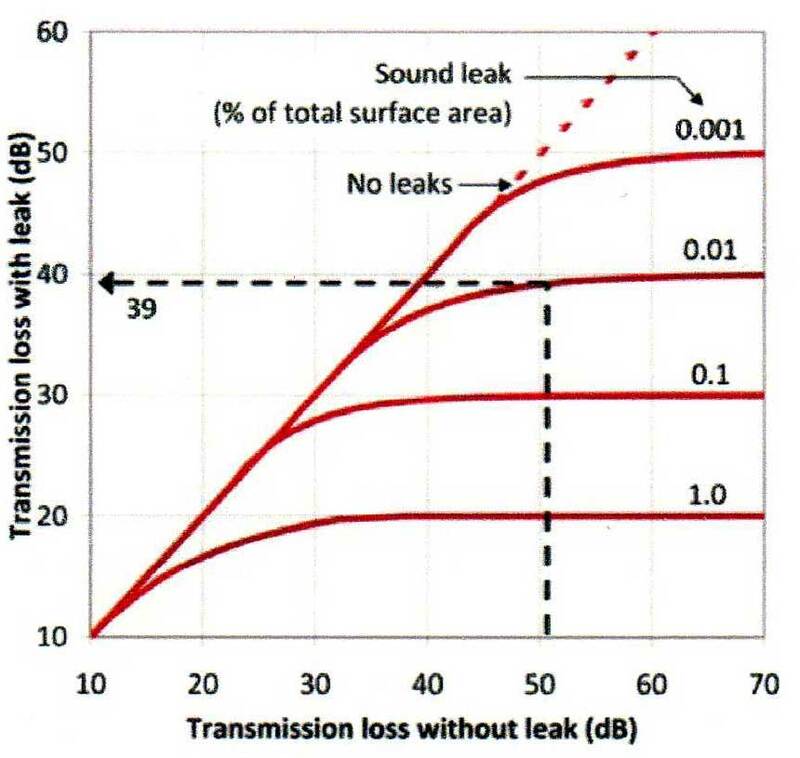 For example, an opening or crack 1/100th of 1% of a total wall's surface area can reduce the sound transmission loss (TL) of a wall from 50 to 39 dB. That's an 11 dB drop in noise control performance. Likewise, a partition designed to achieve a TL of 40 dB would be reduced to approximately 30 dB (a 10 dB drop) with only 1/10th of 1% air leakage area to wall area. Note that the 10 dB drop in the poorer assembly would be perceived by the average person as twice as loud as the better assembly. The above graph illustrates how openings and cracks can affect the TL (and subsequent STC) of a partition assembly. The horizontal axis indicates the design or desired performance of the assembly. 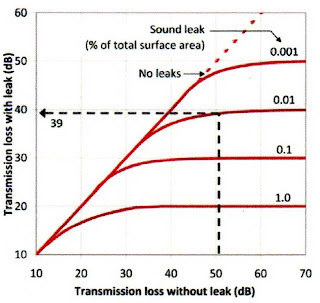 The vertical axis indicates the resultant TL based on the % of surface area air/sound leakage. From the graph, the level of noise control performance will not increase beyond a certain level based on the size of the unsealed air gap. As a result, sealing air gaps reduces sound (noise) transmission through partitions. Less air penetration equals less sound penetration. The beauty is in the details.